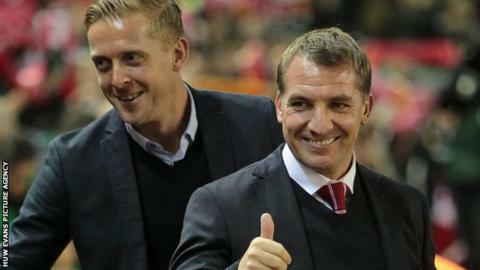 Brendan Rodgers has confirmed he held talks with Swansea City chairman Huw Jenkins about returning to the club as Garry Monk's successor. Rodgers, 43, has been without a club after he was sacked by Liverpool in October 2015. He was linked with a return to Swansea following Monk's departure in December. "I spoke to Huw Jenkins, the chairman, and people I know well but I made it clear, I was pretty open," Rodgers told beIN sports. "Swansea is a wonderful club, and there were also a couple of other Premier League clubs I could have gone back to, but I was open and up front. "I wasn't going to be available to come into a club before the summer." Swansea put coach Alan Curtis in temporary charge after Monk's exit, with Italian Francesco Guidolin subsequently appointed head coach. Rodgers was appointed Swansea manager in July 2010 and guided the Welsh club to promotion to the Premier League in 2011. The Northern Irishman left the Liberty Stadium to succeed Kenny Dalglish at Liverpool in May 2012 but was sacked after three and a half years in charge in October 2015. The former Watford and Reading manager said he wanted to take a break before making a return to management. "I have had five opportunities since I left Liverpool to get back into work, all at clubs I really respect," Rodgers added. "But I just felt I wanted to take some time out. It is very intense when you are in the game."